Ouzel Falls is a nice waterfall. But it is the 2.7-mile journey there that makes this hike spectacular. 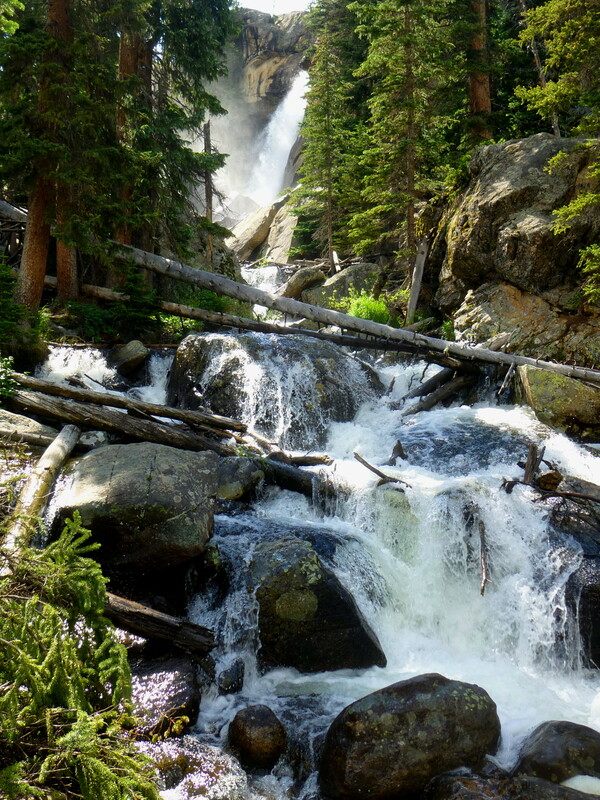 The Wild Basin district, much farther south than the Bear Lake area, is refreshing for its (relative) dearth of crowds, rushing cascades, and majestic views of Longs Peak and Mount Meeker to the north. 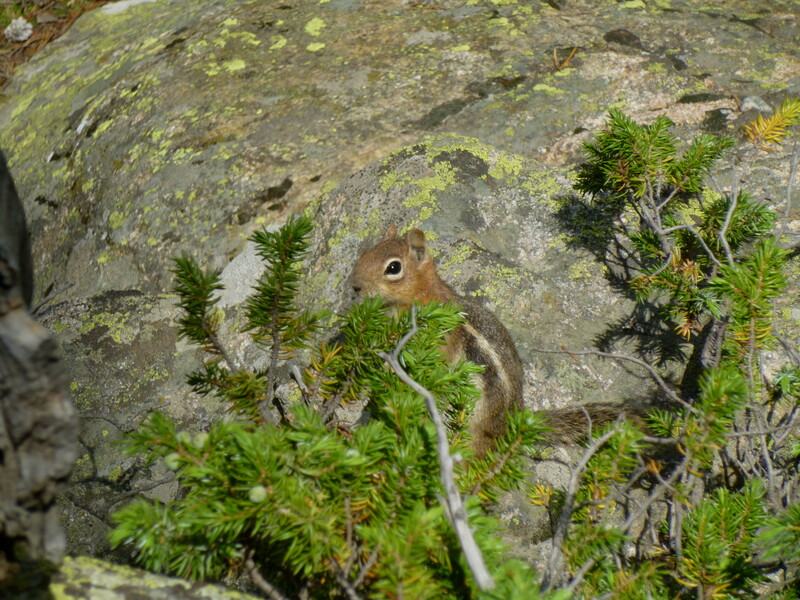 Ambitious day hikers or backpackers may continue all the way to Bluebird Lake or Thunder Lake, which press up against the Continental Divide. But for visitors with only 3 hours to spare, the Ouzel Falls trip is a must-do. In 1998, on our first family trip to a national park, I hiked with my father to Ouzel Falls on a beautiful weekday morning. 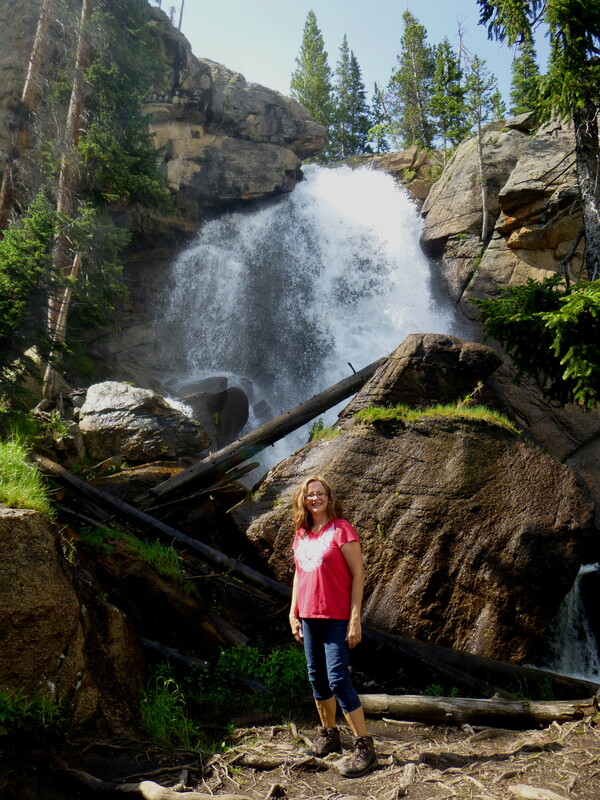 15 years and 25 national parks later, we returned again to Rocky Mountain NP, and this time my waterfall-loving mother was to give this trail a shot. 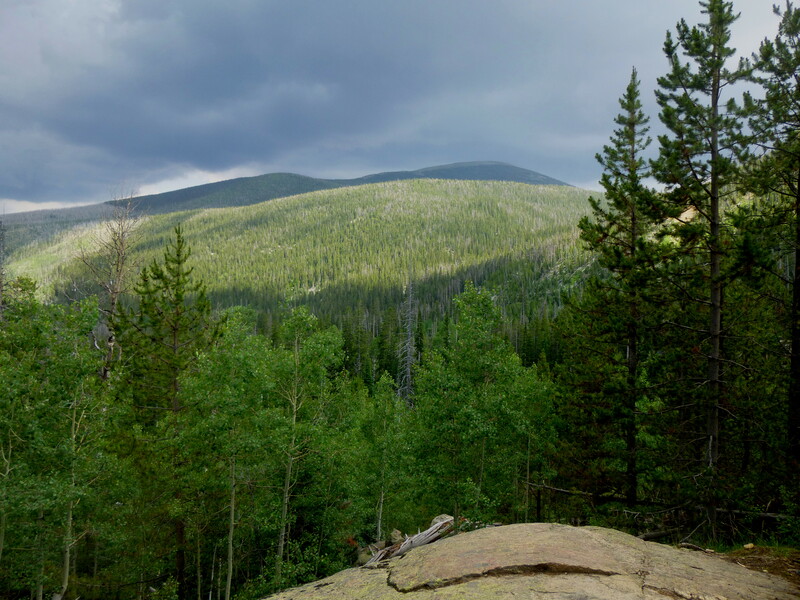 After spending a Sunday morning up on Trail Ridge Road, we decided to risk the chance of afternoon thunderstorms and set off on the 2 ½-hour journey (though I recommend 3 hours). Wild Basin Ranger Station, located at the terminus of a well-marked gravel road some 14 mi. 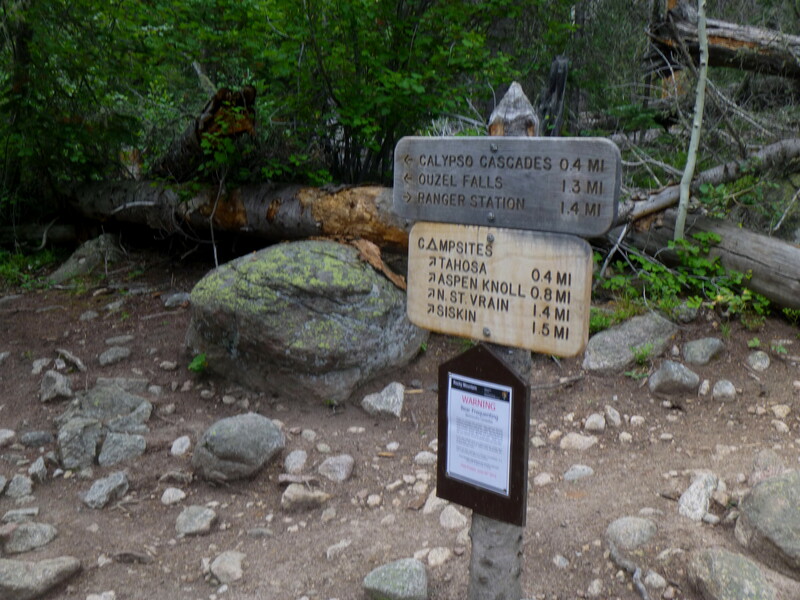 south of Estes Park, marks the start for most hikes in the area. From here, it is 2.7 mi. 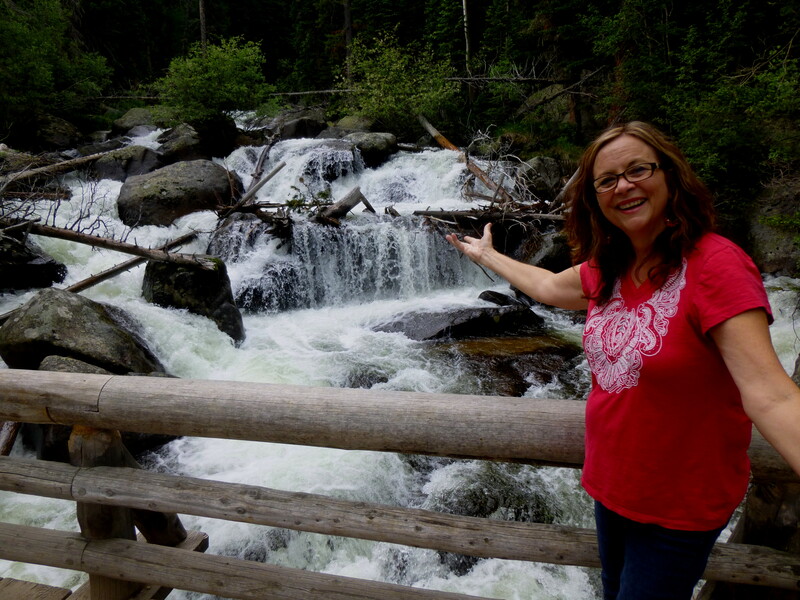 and 950 vertical feet to Ouzel Falls. 2.7 miles one-way can be quite a bit for children or hiking newbies. Fortunately, there are plenty of distractions along the way, beginning with Copeland Falls, just 0.3 miles up the trail. At the lower section of the falls (denoted by a “Copeland Falls” sign) North St. Vrain Creek tumbles 5-10 feet into a pool. This is a popular destination for families with small children looking for only a short trip. Following a marked spur trail, hike 1/10 mile farther to reach Upper Copeland Falls, more of a series of cascades flanked by mighty boulders. If unconcerned for time, this is a delightful place to stop for a snack or picnic. Continue off to the right, where the spur route quickly meets up again with the wide, well-maintained main trail. The first 1.4 miles from Wild Basin TH are quite easy, mostly flat with the occasional gently-sloping uphill. 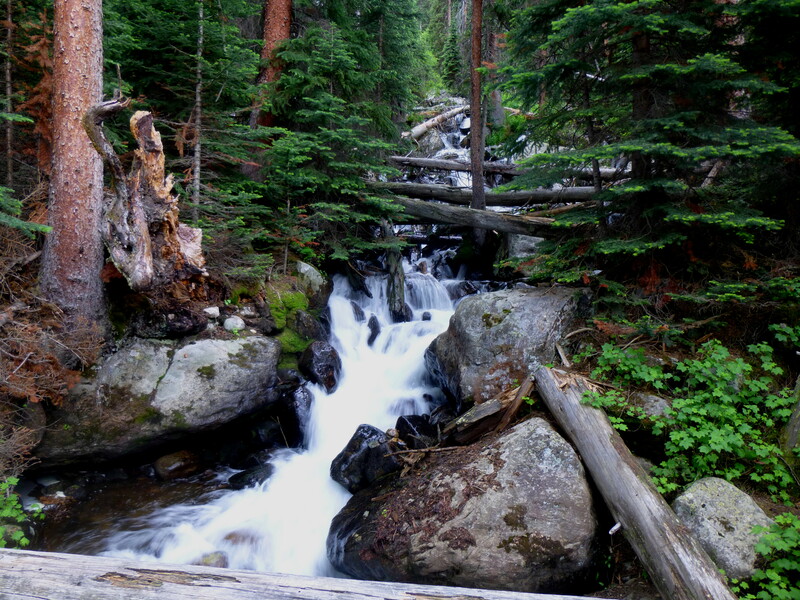 While predominantly forest-covered, the rocky path periodically abuts North St. Vrain Creek. 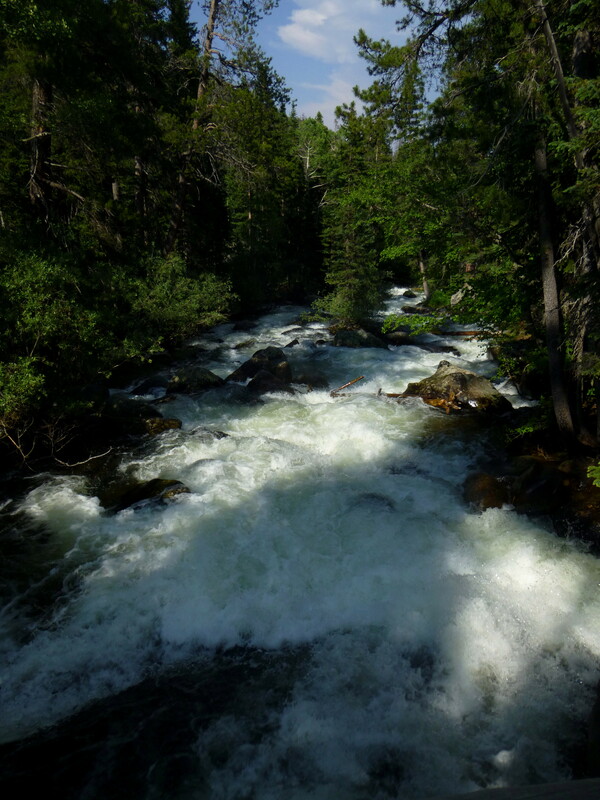 At virtually every vantage point, the creek is roaring wildly over rocks and falling logs. 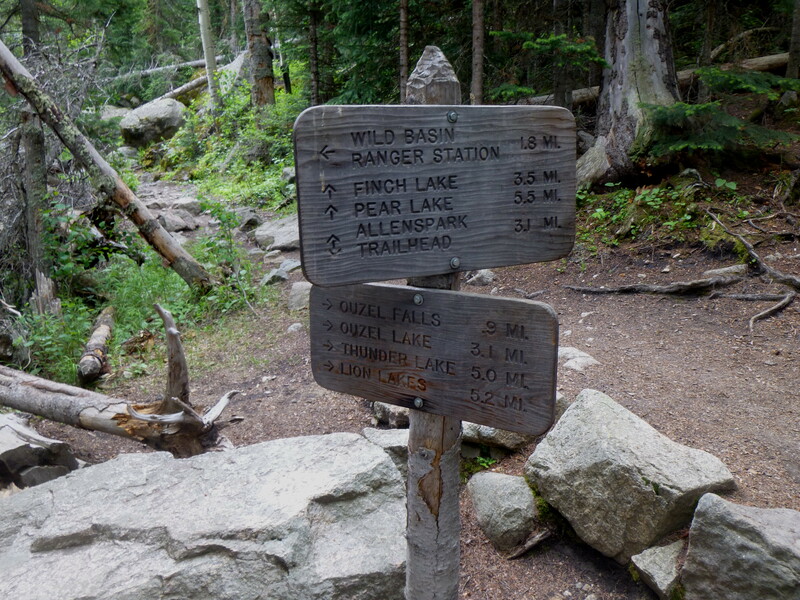 After 1.4 miles, hikers are faced with a choice. To the right, an alternative route skirts the northern banks of the North St. Vrain past five campgrounds. Taking this option, one could construct a slightly longer loop (see map) to/from Ouzel Falls. This is also the most direct route to Thunder Lake. To the left, however, lies the quickest path to Ouzel, via Calypso Cascades. Within 500 feet, cross North St. Vrain Creek. 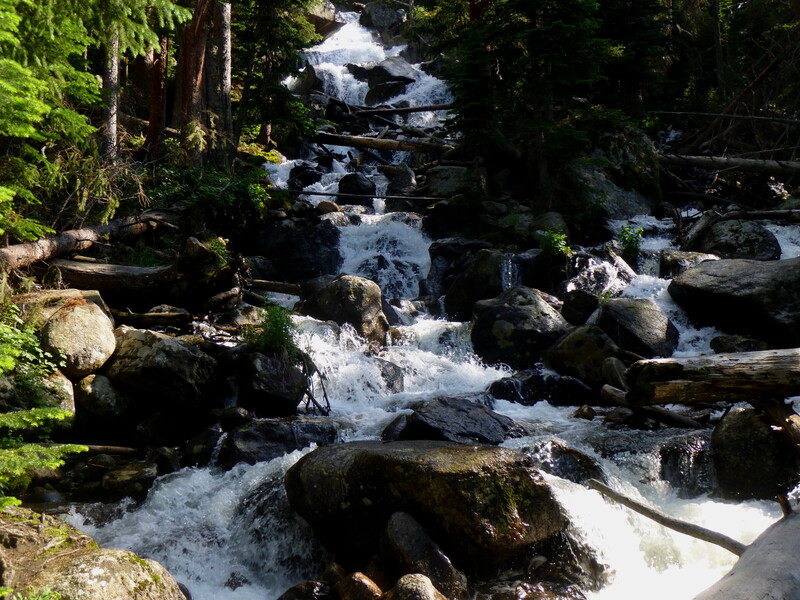 The rolling cascades here are impressive in their own right, a teaser for what is to come. After the bridge crossing, the trail noticeably begins to climb. About ¼ mile up, turn off at a large rock outcropping for a glimpse at the point where Cony Creek tumbles down a steep slope to meet the North St. Vrain. 0.2 miles later, most of it an uphill slog, hikers again face an intersection. 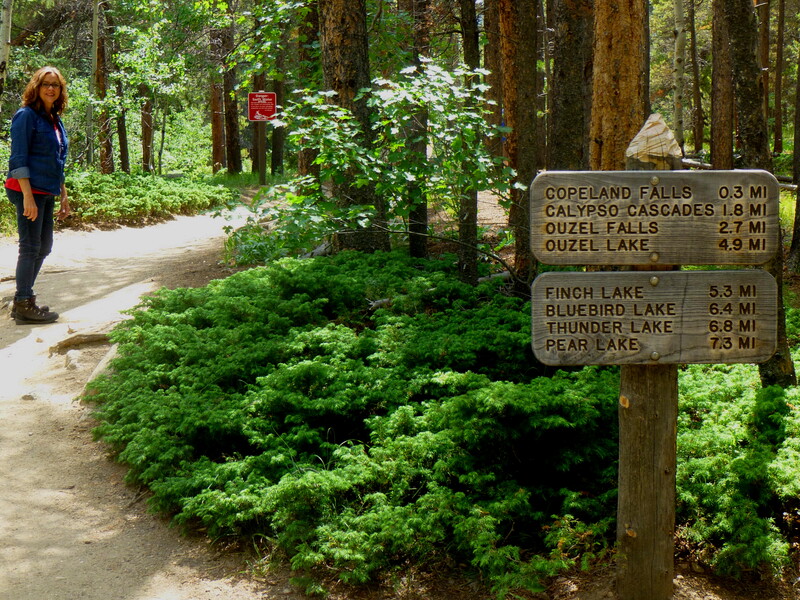 To the left, the Allenspark Trail leads 3.1 miles to Allenspark TH or 3.5 miles to Finch Lake. Best to save that for another day. 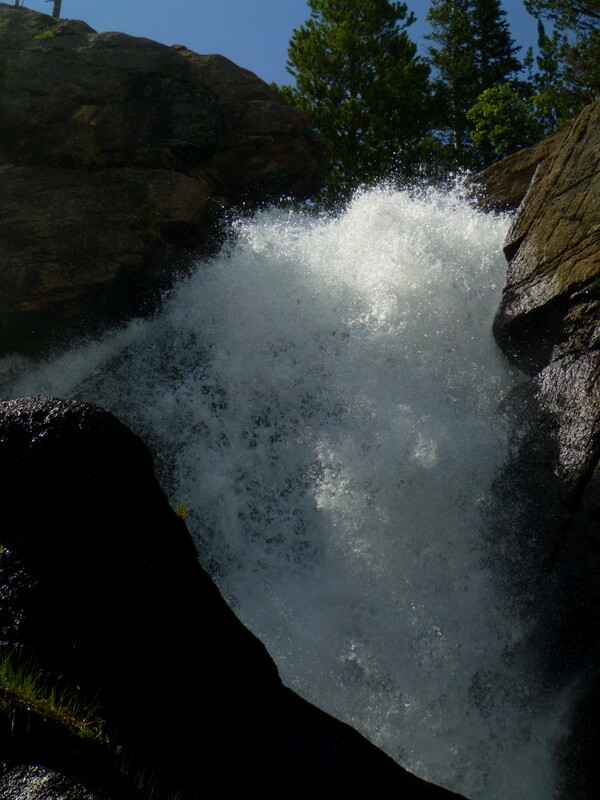 This point also marks the best viewing point of spectacular Calypso Cascades. 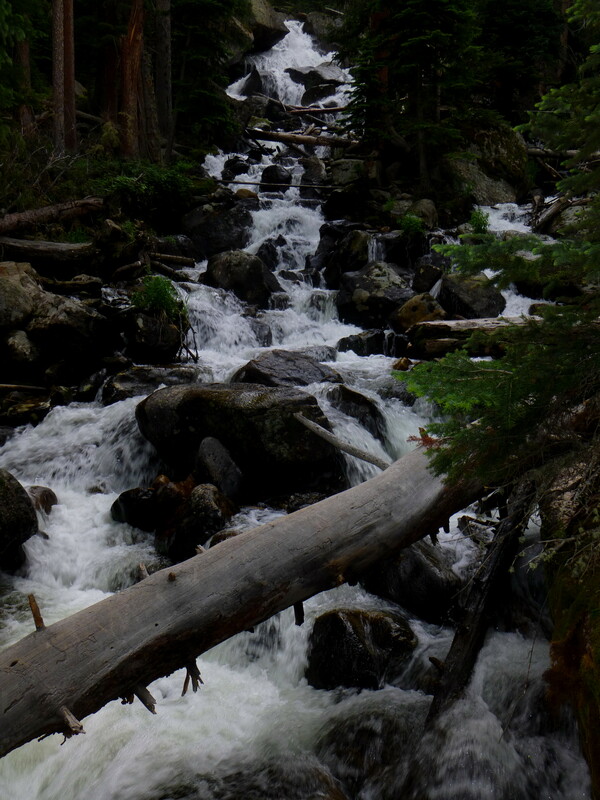 Photos truly do not do justice for this chaotic, multi-tiered torrent of water. Cony Creek here is almost deafening, passing under a bridge that offers the most direct view. This is Colorado wilderness at its finest. After sufficiently taking it all in, turn the corner to get another view of the cascades, this time tumbling down a slightly different slope. After Calypso, the scenery changes. Climbing the remaining 200 feet to Ouzel Falls (though it seems steeper! 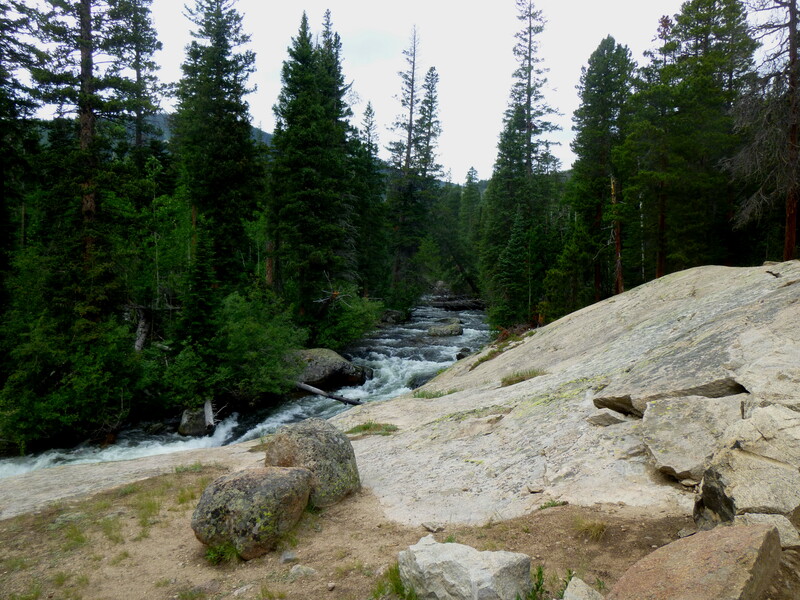 ), the trail is now a couple hundred feet above the North St. Vrain and dips in and out of dense thickets of conifers. In the open sections, hikers can catch a glimpse of Longs Peak (14,259’) and Mount Meeker (13,911’) to the north as well as Meadow Mountain (11,632’) to the south. 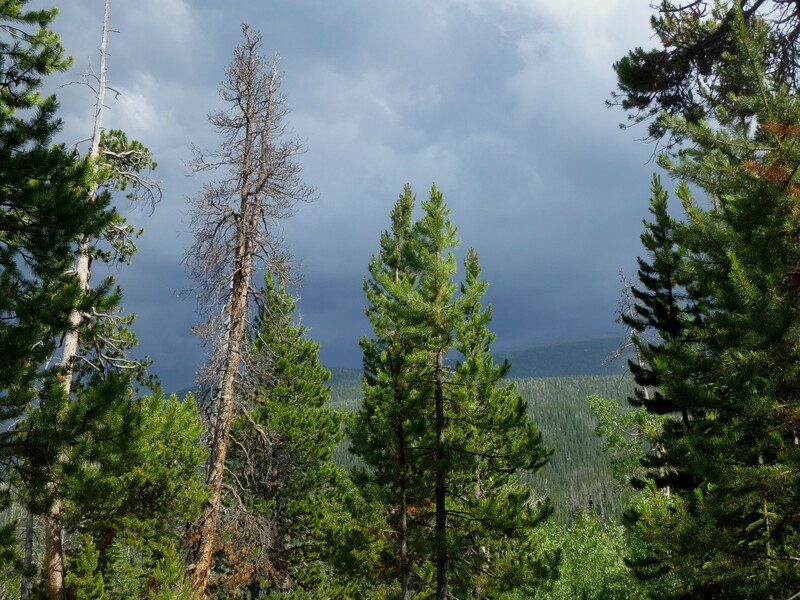 On the afternoon of our hike, the rain clouds were quickly catching up to us…or so we thought. The booming thunder kept us on our guard. But with the exception of a short drizzle, we mostly evaded the storm. Rolling down from the northwest, the storm clouds dropped buckets of rain on Wild Basin Ranger Station, but we escaped scot-free! Skirting the edge of a ridge and crossing a couple streams, the final 0.9 miles to Ouzel are filled with “I can tell we’re almost there!” moments. Alas, one must always come back to the golden rule of hiking: you’re never as far as you think. Of course, finally the questioning pays off, coming to a point when you turn around a bend and correctly hear the roaring waterfall ahead. Ouzel Falls is most often viewed from a bridge crossing Ouzel Creek, though one is about 100-200 yards from the falls at this point. A closer look involves a bit of off-trail work along the left bank of the creek, including scrambling over some rocks and through a couple thickets of bushes. Though a massive boulder (slippery, so do not recommend climbing) blocks part of the view, one can still undeniably capture the majority of the falls here in a photo. 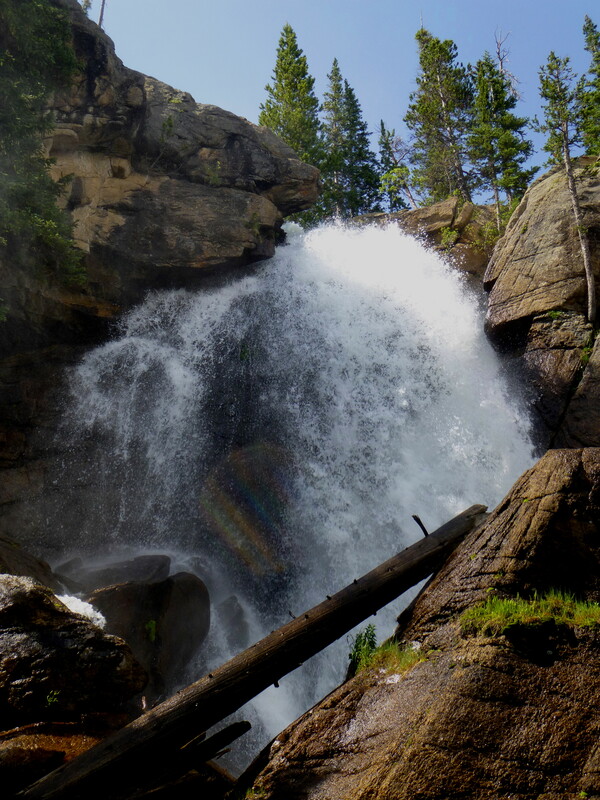 Here Ouzel Falls drops 50 feet off a rocky shelf, often forming modest rainbows below. Find a nice (and dry) rock with a view to take a break and grab a snack. On a weekend or a weekday afternoon, you are almost certain to see other visitors here. It would be quite easy to spend hours exploring and relaxing by the water in Wild Basin. 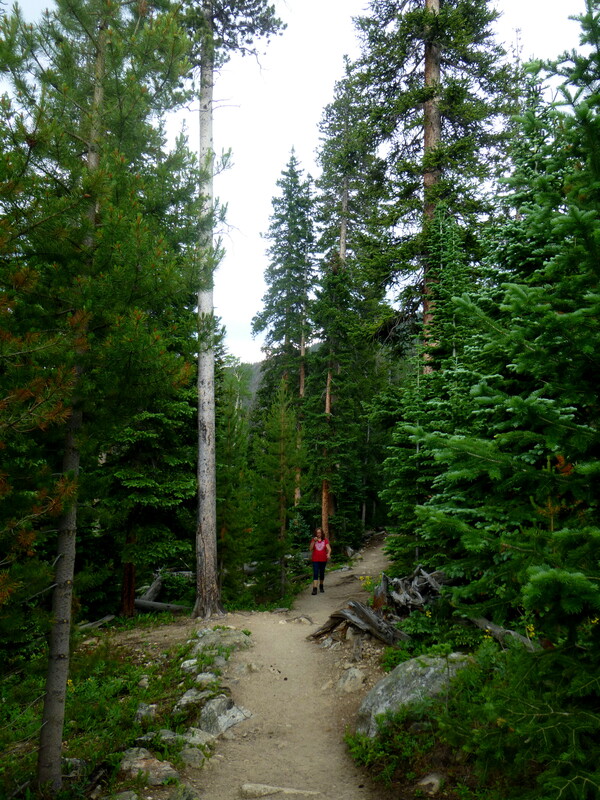 It is also extremely tempting to continue up the trail to the right toward Bluebird or Thunder Lake. 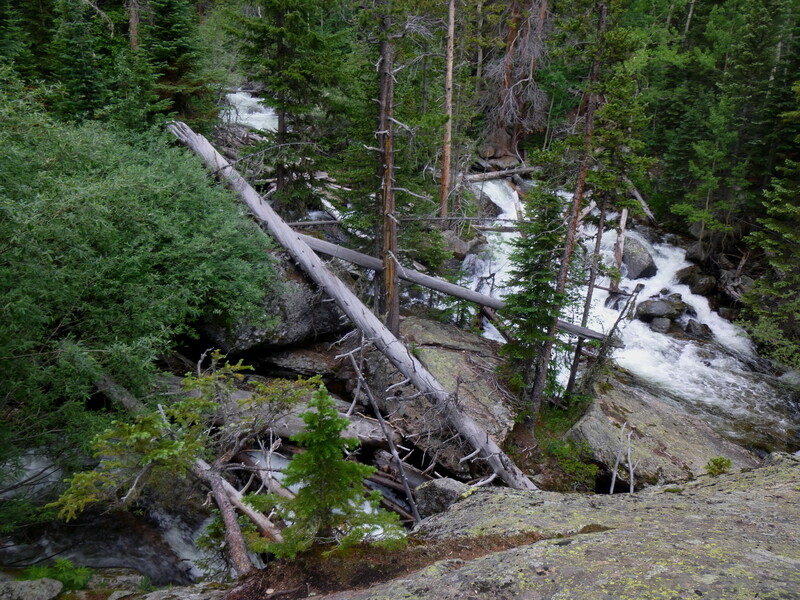 But unless you have an entire day to spare and the energy to trek on, Ouzel Falls will likely be the terminus for your hike. 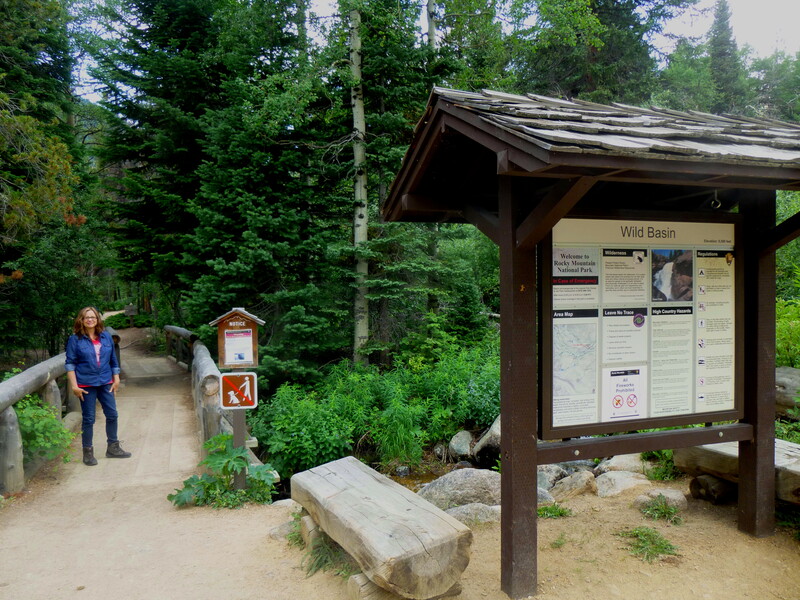 From the bridge spanning Ouzel Creek, proceed back the way you came, or continue a bit farther to complete the loop (more of a lasso) via North St. Vrain Creek and the campsites walk noted above. 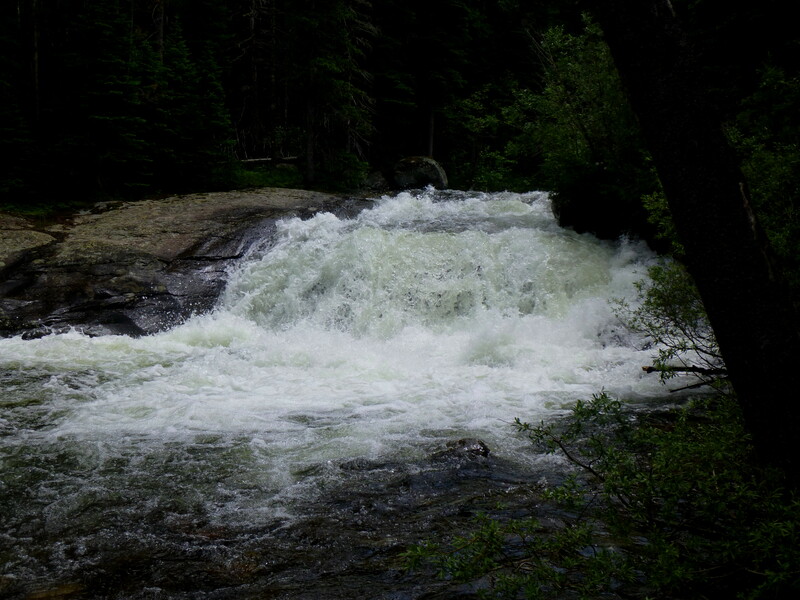 If travelling to Ouzel Falls, allot at least 3 hours for the out-and-back. For the “lasso,” tack on an extra 45 minutes to an hour. 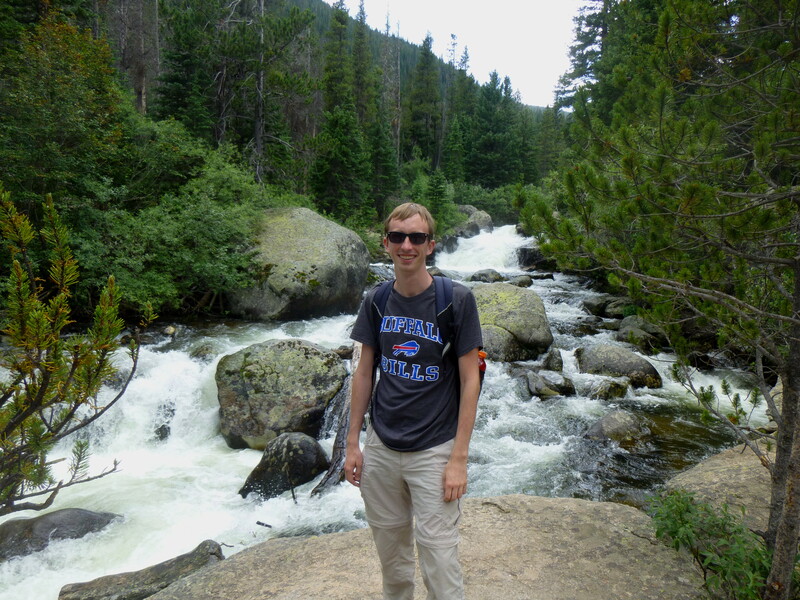 This entry was posted in Colorado, Moderate Hikes, Rocky Mountain National Park and tagged Calypso Cascades, Colorado, Cony Creek, Copeland Falls, Mount Meeker, North St. Vrain Creek, Ouzel Creek, Ouzel Falls, Rocky Mountain National Park, waterfall, Wild Basin. Bookmark the permalink.